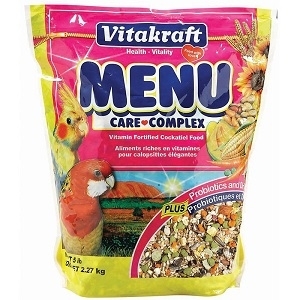 A nutritious diet of seeds, grains, veggies, fruits, nuts, and specially fortified pellets designed for cockatiels. MENU Cockatiel Food contains a balance of nutrients especially suited for cockatiels. The high bio-availability of ingredients means that birds get the nutrients they need in a form that is easy to digest, to help keep them healthy, happy, and playful.